Home > Dollar, Fiat	> What is the true value of your dollar? 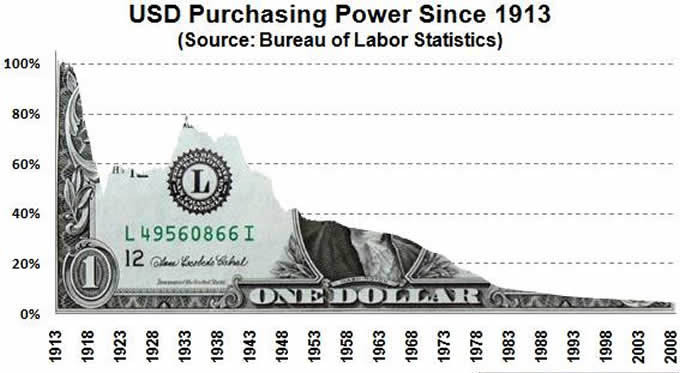 Ever since 1913 when the Federal Reserve was created the dollar has been loosing its purchasing power. Currently you can only purchase at 3 percent today of the 100% that you could buy in 1913 resulting in a 97% loss. For instance milk was just an average of 32 cents a gallon in 1913. Today, the average price for a gallon of milk is $4 or more. Almost everyone tends to think that everything is getting more expensive when in reality the purchasing power of the dollar is going down which is the cause from inflation (which have averaged about 3.3% a year). It is only a matter of time when these Reserve Notes are declared worthless, hopefully, I pray you were wise enough to invest in physical precious metals. Remember the age old cliche “Where there’s smoke, there’s fire”. Thanks for this post. I literally agree with what you are saying. I have been talking about this subject a lot lately with my father so may this will get him to see my point of view. Fingers crossed!